Chef Ray Garcia has introduced elevated tacos to Downtown's lunch and dinner crowd, creating B.S. 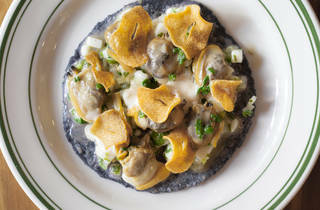 Taqueria as a prelude to his newest restaurant, Broken Spanish. At the taqueria, clams and lardo tacos are offered alongside more traditional offerings such as carne asada and carnitas. Try the rice and beans (which is nothing like what you're imagining) and the heavenly tres leches cake. Some great food right in DTLA! BS Taqueria is a great spot for delicious food! The homemade tortillas are to die for and wish they gave more of these without paying extra. All the dishes are served tapas style (not my favorite because they're overpriced) but the food is fantastic! The dishes are full of flavor and wants you to enjoy every bite! I know they have a great happy hour which I'd love to try one day so definitely coming out here again sometime! A friend suggested I check out this restaurant as it was near my hotel in downtown L.A. and I'm so glad I did. Definitely start off with the gooey bean dip and ask for extra chips—they don't give you nearly as many as you need to scoop up all of its gooey deliciousness. It's also great on tacos. Speaking of which, the carnitas and mushroom tacos are superb. I've admittedly only tried the papas y chorizo tacos here, and they're pretty tasty albeit messy. But those churros... I would come here just to order a plate of the most perfect churros I've ever tasted. The back room has a bit of a weird rainforest-themed elementary school classroom vibe going on, so enjoy your churros in the front if you can. Did I mention the churros? B.S. Taqueria gets a lot of dishes right, and boy are they delicious, but not everything on the menu is equally superb. Though, that is not to say that I've ever had a bad dish, they just aren't all at the same level of quality. At the end of the day though, you should really be going there for the churros, but cause they are out-of-this-world good. The tacos are great, but the desserts are where it's at! The churros are some of the best I've had and the Tres Leches Macadamia cake is out of this world! This place is awesome! The chicken tacos are just the right amount of spicy '. The guacamole is delicious especially with their sauces. The service is impeccable and though I didn't try any, their desserts look insanely yummy! Such a great place for lunch! The service is outstanding, very friendly and super helpful especially if you are vegan/gluten free. They were so accommodating to my dietary needs, I can't wait to go back for dinner and to try their margaritas! This is one of the prettiest restaurants I've been to Downtown. The design is great, and even if you don't sit in the back room, you've got to check it out for the living ceiling and the amazing mural! (Many a selfie has been taken here, including my own.) The clam and lardo tacos can't be beat, and the drinks are super fun too. I have two favorite dishes at B.S. Taqueria. 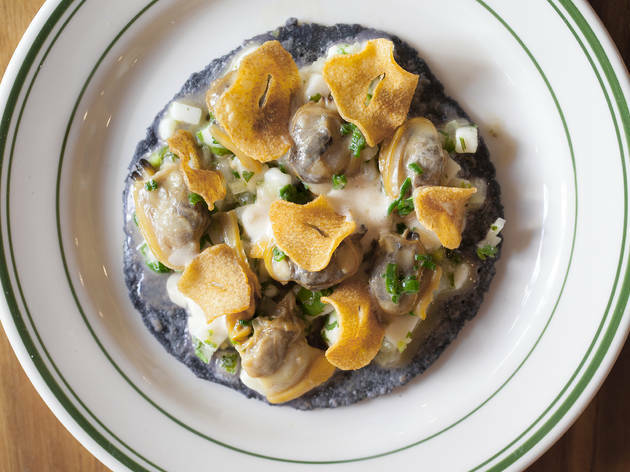 One, the clam and lardo tacos—which, duh, everyone loves those. And two, the churros, which are some of the fluffiest, lightest pieces of cinnamon and sugar dough that I've ever tried. They come with a creamy tub of chocolate that, while not necessary, just brings the churros to a whole other level. I wasn't the biggest fan of some of B.S. Taqueria's other savory items, but I'll be back for these two standouts soon.